- New level: Tomorrow Hill, on the eponymous song taken from Wario Ware Smooth Moves. - Press 'start' button to restart the game. - Added a 'old game boy yellow' color palette. Note: Due to technical reasons (sound bug with PAFS in the current version of PAlib), the first level is not included in this release. - Improved detection of the rhythm. Now it should be much easier to adjust jumps. - The number of jumps is displayed during the game. 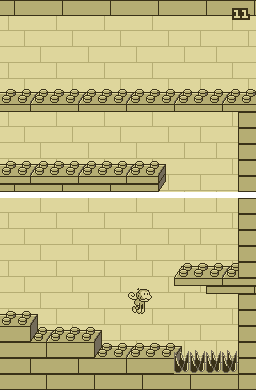 - Improved collision with spikes. Now, you can touch the side of spikes without being hurt. - Fixed a minor graphic glitch when restarting the game. - Minimized the gap between two loops of the song. - Minor adjustment in background 2. 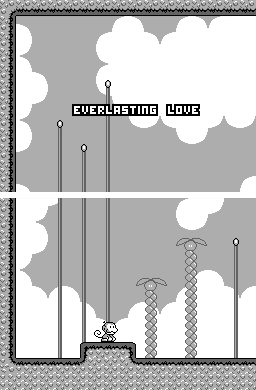 Everlasting Love is a combination between a 2D platformer and a rhythm game, in which you have to adjust your jumps using the music. The song played during game, Everlasting Love, is taken from the original soundtrack of We ♥ Katamari. As usual, I'll upload the source code later. - The monkey can move right and left during jumps only. No walking. - As soon as he touches a wall, he holds on it until the next jump. - The height of the jumps depends on your rhythmic accuracy. The closer to a beat you press A, the higher the jump will be. However, the objective is not to perform the highest jumps possible, but to adjust your jumps depending on the platforms. 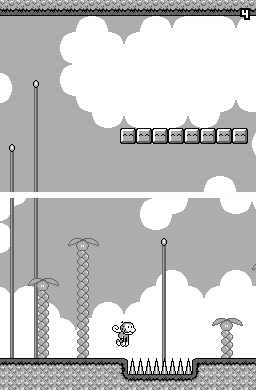 The aim of the game is to reach the end of the level, making as few jumps as possible. - ◄ / ► : move during a jump. - A : jump. The height of the jump depends on your rhythmic accuracy.